STP Bench Number : 3 - Update - the HeartMath "Achievement Level"
So we're here in the STP Virtual Lab, at Bench #3, where investigations studying HeartMath's devices are ongoing. When using the HeartMath "emWave2" device, one of the outputs or parameters tracked is "Achievement." But what does the value obtained after a session mean? Where do the numbers come from? What contributes to the value? Since "Coherence" is what one is training for, one might assume that "Average Coherence" contributes to "Achievement." Is that assumption correct? And to give again one of our preferred quotations: "How would you know?" (W.Ed.Deming). draw conclusions emerging from the data analysis. Here in our "Virtual Lab" at STP, we're looking at any and all methods, modalities, and technologies that could contribute to The Challenge at SendThemPeace.com. So if we can find a link between something at HeartMath, and especially its Global Coherence Initiative, and bringing more Peace into Our World, ... we're going to study that link, and very seriously. But if we go back to that "Individual Coherence" level training, let's accept for this discussion, accomplishing at least that as a foundational or starting point for the higher levels of global accomplishment proposed by HeartMath. So here in the STP Lab, we've been looking at different aspects of the emWave2. It's a bit like looking at a black box and wondering : "Gee, I wonder what's inside of that thing? I wonder how it works?" But before getting out a screwdriver and pliers to answer the question, (too expensive a device to do that), is there another way to know? Yes! Let's see how it performs by analyzing its output: it's data. So if you're interested in using your emWave2 to reduce stress levels, (and to see if you're making progress or not) HeartMath couples that to a variable that they simply call "Achievement." Higher "Achievement" in a session, might let you feel better about making progress in your practice: Might suggest, if values show a trend, that you're improving in obtaining "Individual Coherence." This is a lot to look at, but "Achievement" level is represented by the orange bars for each session. Under each bar, and also in the data table on the right, a quantity for "Achievement" is given (954 in the highlighted session). Now other data are also presented. 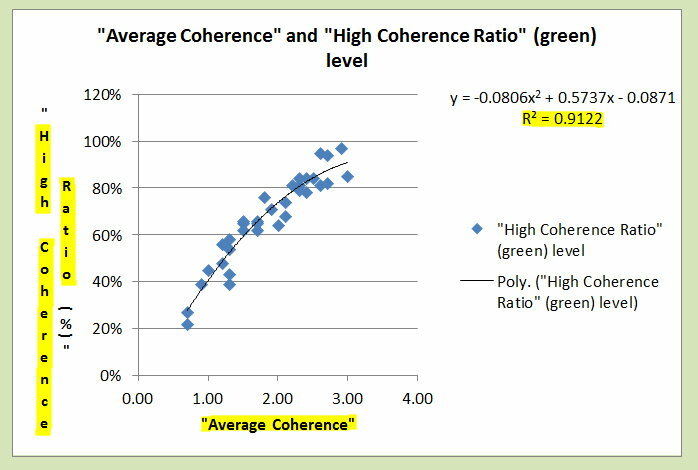 The tricolored bars below present "Coherence Level Ratio : Low (red), Medium (blue), High (green)." Also given are Duration (31 minutes, 53 seconds for this highlighted session), and a value for "Average Coherence," (here, 2.5). And of course, though not given, one can count up all the sessions one has data for. Here, that's 28 showing, but the grey bar at the bottom lets one scroll to previous sessions. So in this case, we find 34 sessions in all for this one subject. Some people prefer "Average" to "Mean" (which is the more correct term), but let's move along. The "High Coherence Ratio" (green) level, indicates for these sessions: "How much of the time was the green diode or light on the emWave2 illuminated?" Answer from the data: from a Minimum of 22% to a Max of 97% in a single session, and a Mean of 67±18.9% of the time, says the data table. Our topic here is "Achievement," which ranged from 65 to 1,907 and with a Mean "Achievement" for these 34 sessions = 509.03­ ± 383.3. 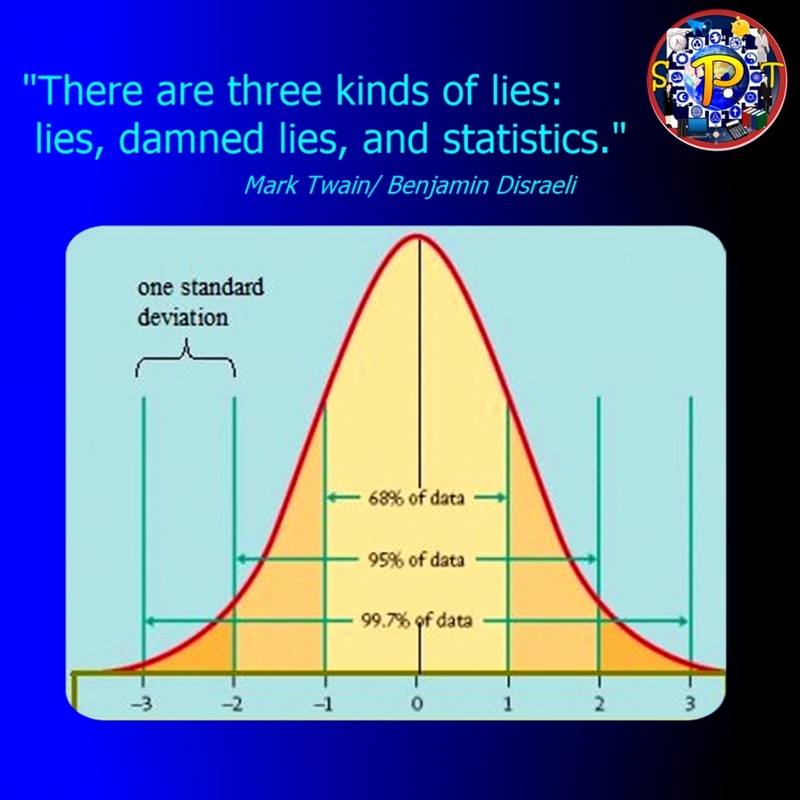 If you don't know, the standard deviation (383.3) gives one an idea of the variation around the Mean value. Explaining more about standard deviation is for another day, but the smaller the number, the smaller the variation or distance of data values from the Mean, and vice versa with large std. deviations. "Did "Achievement" improve from one session to the next?" Which suggests what? That there was some improvement from one session to the next, but not always. 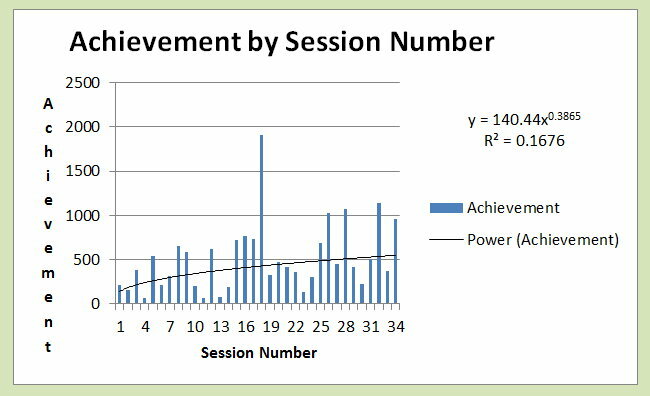 I prefer to look at that with, instead of a bar graph, a scattergram, where each dot or lozenge represents a value for "Achievement" and the Session number that goes with it. Ahh... and what does this teach ? It doesn't explain "Why?" But just that with increasing Sessions, the "Achievement" value seems to rise higher. The "tighter" the lozenges cluster around that green curve (the trend curve), the more closely the two variables are related. The trend is commonly described with a line. But the best "fit" of the data here, was with a curve. A Power Curve, also known as a "long tail" distribution is trying to tell us something, but we'll see that below. Generally with Power Curves, they follow an 80:20 rule where 80% of the effect happens in the steep part of the curve, but let's move on. 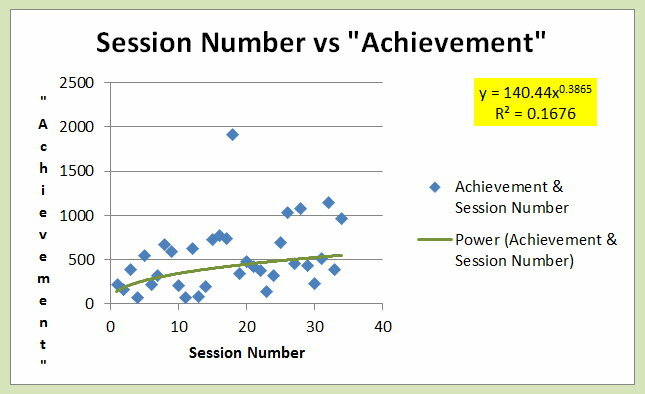 NOTICE R² = 0.1676 ... this tells us that 16.8% of the variability in "Achievement" is explained by variations in the Session Number. There is nothing mysterious or magical about Session Number. It simply defines a continuum from point a to b. Of course, to increase Session Number, one need just get out one's emWave2 and do another session! Notice first, that this is about two variables, but not "Achievement." Looks very strong. Blue dots all "scrunched together" around the line, suggests a strong relationship. 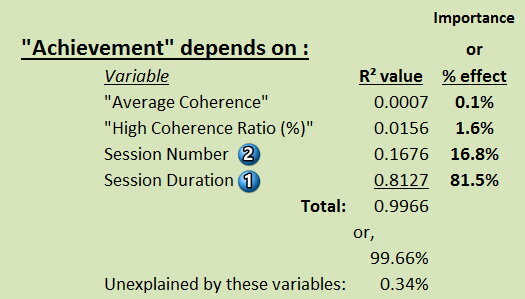 R² =0.9122 says that 91.2% of the variability in "Average Coherence" is reflected in the variability of "High Coherence Ratio" (when the green diode is lit. Again, the best trend line is not a line at all, but a curve defined by a polynomial equation, given above that R² value. That equation can be used to predict one value from the other, but let's not lose focus. Back to "Achievement." 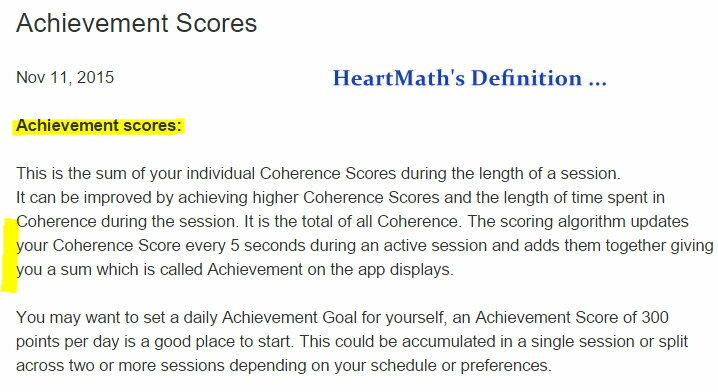 These values for "Coherence," central to HeartMath's presentation, must surely be associated with levels of "Achievement." Yes? Let's see. How about "High Coherence Ratio" versus "Achievement"? It would be natural to assume that the longer that green light stays on when we do a session (= "High Coherence"), that we'll blow the roof off of "Achievement." That hypothesis seems dead wrong. Notice that the blue lozenges look a bit like a shotgun blast. They do not cluster tightly around the green curve. Notice that the green curve (again, defined by the polynomial equation in the upper right), is pretty horizontal. So a given value of "X," ("High Coherence Ratio"), give a whole host of values for "Y," ("Achievement"). Notice R². 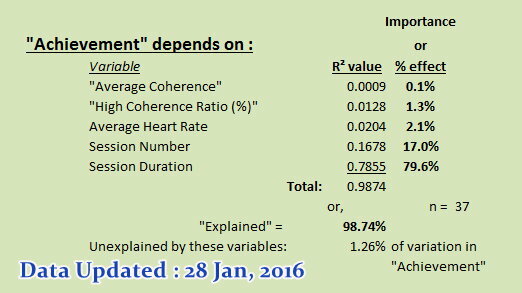 R² = 0.0156 or, the changes in "High Coherence Ratio (%), explain only 1.6% of the variations observed in "Achievement." Well how about "Average Coherence." That's a number that users focus on and try to improve from one session to the next. 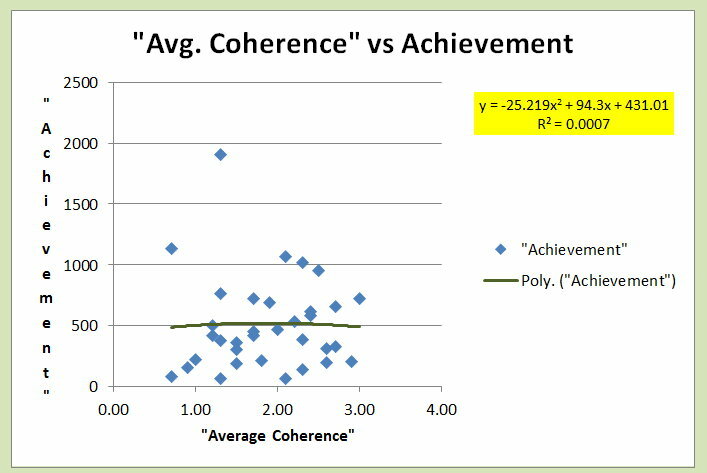 Is "Achievement" determined by, or more correctly, does it vary with levels in "Average Coherence" ? Ooops! Bummer, Melissa. It doesn't look like changes in "Average Coherence" are very associated to changes in "Achievements" score. Sorry! In fact, with another "shotgun blast" dispersion of the data points it was unlikely at first glance. More accurately, with an R² value = 0.0007, this means that only 0.07% (yikes!) of the changes in "Achievement" score, are linked to changes in "Average Coherence." Now maybe your values would be different than this person's values and use of his emWave2. Send me your values and we'll see (Excel format please!). But given this study subject's results, ... I'm not hopeful that your results in this domain would be very different. Discovering results that vary greatly, between his and yours, would in fact require even more explanation. Unfortunately, our data do not confirm this definition, and especially not the supposed link of "Achievement" to "Coherence." So is that it ? Should Melissa just put her emWave2 back in the box and go to the gym? Meaning, are we done looking at all available potential contributors to this perhaps arbitrary "Achievement" value associated with each session? No. Not at all. And in fact, we will finish by defining that the "Achievement" score is not at all arbitrary, and that we know with almost 100% certainty where it comes from. We have more data! Never ignore available and valid data. The Session Duration values don't demand any interpretation. They are created by each push of the emWave2's On/ Off button. So this subject did 34 sessions lasting 26.25±28.54 minutes, as short as 2.8 minutes, and as long as 136.6 minutes. Any relationship to "Achievement" ? The longer the session, the higher the "Achievement" score. The trend curve doesn't go horizontally from right to left, it rises briskly from its origin at 0 and 0, up towards the grid's right upper corner. This suggests that unique changes in one variable, "give" unique (or nearly so), results in the other. The best mathematical description of this relationship was again given by a curve and not a straight line. We don't draw these lines with a pencil: the data define the curve, and ultimately the equation to describe it. Notice R². R² = 0.8127 which means that 81.3% of the values observed for "Achievement" are defined by observations and measurements of "Session Duration." That relation is positive, meaning the longer the Session, the higher the "Achievement" value. It could have been an inverse relationship: the longer the Session, the lower the "Achievement," just to include what's possible. But it's not like that in the data. Simply put: want a higher "Achievement" score coming out of your emWave2 session? Sit longer. So Anne, Clark, and Meslissa what can we get out of this for the next time an emWave2 Session gets underway? Well, here's another cool thing one can do with these several R² values. One can add them up. 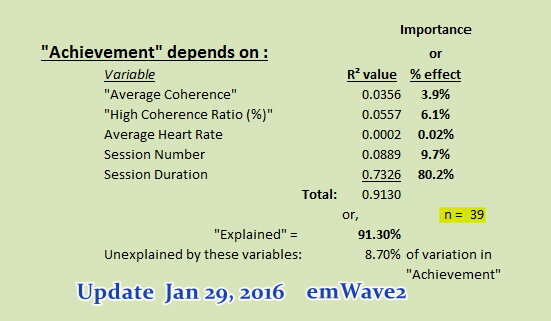 By adding the R² values, we see that we have explained 99.66% of the variability seen in our emWave2's "Achievement" values. 0.34% of that variation in "Achievement" remains unexplained: a mystery still to be solved. 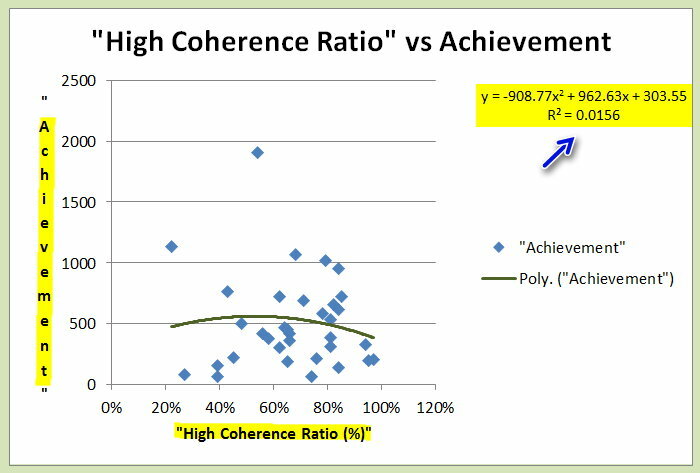 "Coherence" levels obtained, (either as "Average Coherence" or "High Coherence Ratio (%)" (call it 'green light time as % of total') have less than 2% effect on "Achievement." #2 is Session Number (which one could call length of training from its start). You want to have higher "Achievement" values? OK. Just keep sitting with your emWave2, day after day, and for longer and longer Sessions. Don't worry about "Coherence." Recall as well that these data are just from 1 individual, and 34 sessions. Nevertheless, the results are somewhat compelling. Anne, Clark and Melissa ..., I hope this has helped, and shed more light than heat! "Explained = 98.74% of variability observed in "Achievement." Notice that Average Heart Rate, only contributes 2.1% of the variability found in "Achievement." 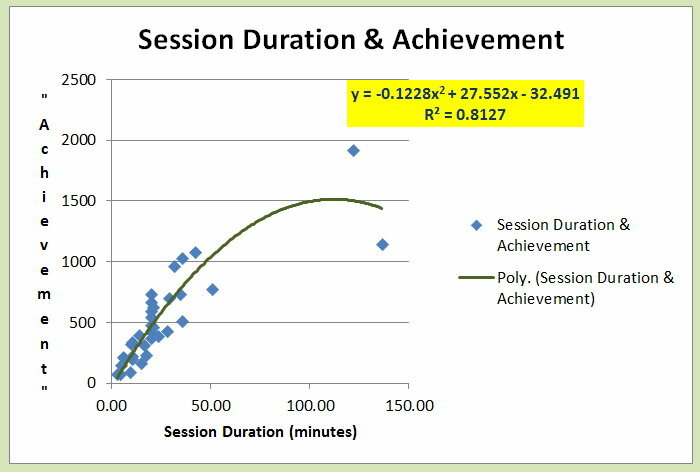 Session Duration remains the most closely linked determinant of "Achievement." The STP Virtual Lab - "How Would You Know?"